The Multiple Sclerosis Diet Book, by Dr. Roy Swank was the very first book on MS that I ever read and I am so grateful that it was, for it sent me on my journey to Beating MS. 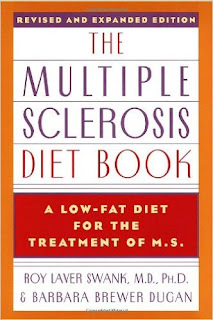 While this book was last published in 1987 and the author has since passed on (at age 99 from following this diet despite not having MS), I feel that it still provides a solid foundation into the understanding of MS as an autoimmune disease and how significantly the role of diet has on the disease itself. I read this book in two days and immediately adopted Swank's low-fat diet approach to MS when I was initially diagnosed. I credit it for ending my attack at the time and for getting me back on my feet. I have since evolved my diet to eliminate all animal products, but still revisit this book from time to time. I think it's an invaluable addition to one's Beating MS Library.